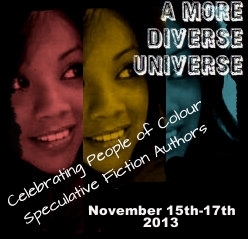 This weekend is the second iteration of the More Diverse Universe effort, where participants review speculative fiction books by writers of color in an effort to call attention to the diversity that’s out there in the field. You can follow posts on Twitter with the hashtag #Diversiverse; the event is the brainchild of Aarti at the Booklust blog. Her post on the event is . 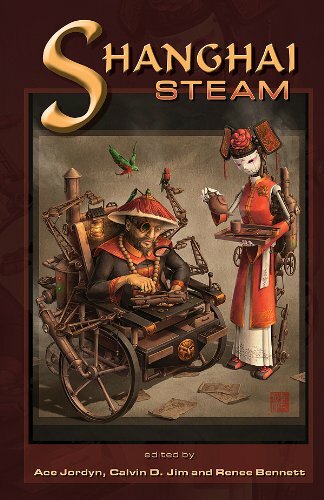 I chose to read Shanghai Steam, an anthology of wuxia steampunk stories. The cover art is by James Ng, a favorite of mine, and the mix of stories is quite good. There are 19 authors, each with one contribution. They are Tim Ford, Amanda Clark, Laurel Anne Hill, K.H. Vaughan, Crystal Koo, Brent Nichols, Julia A. Rosenthal, William H. Keith, Shen Braun, Jennifer Rahn, Emily Mah, Frances Pauli, Camille Alexa, Tim Reynolds, Ray Dean, Frank Larnard, Derwin Mak, Nick Tramdack, and Minsoo Kang. As you can guess from the list of names, not all of these are writers of color, but I love the diversity among the authors as well as the different take on steampunk they provide here. One of my favorite things in several of the stories is the concept of qi-powered machinery, either in place of or addition to steam power. I also really appreciated the number of strong women characters in the collection. (I was sad not to see more diversity of sexual orientation or gender identification explored, but one can’t have everything, I guess.) Most of all, I loved the aesthetic that ran through the book, used very differently by each author, of Chinese spirituality, tradition, philosophy and history. The wuxia tradition of the martial arts hero who fights against oppressors is brought to life in a variety of ways in this collection. Some were funny, some were sad, some were uplifting, and while some spoke to me more than others, there were no weak stories in this anthology. I had a list written of the seven or so that spoke most strongly to me, but I managed to lose it while writing the rest of this post. I can’t recreate it, because going back through the stories, I’m finding different nuances and new favorites; I think that says a lot about the overall quality of the work here. ETA: Here’s a link to the list of other More Diverse Universe participating reviews. Thank you very much for this very thoughtful review. I hate losing my notes, but so often I forget to refer to them by the time I write my reviews anyway! This collection of stories sounds intriguing; it seems we hear much more about Japanese warrior stories than Chinese, because of the manga/anime, maybe. This sounds like a really interesting compendium! I wonder why so many of the authors are non-POC, though – I’d think they could make an effort to include more of them. Glad it was a good read! The reason we only had a handful of POC authors is simple: we did not receive as many stories from POC authors as we would have liked. I wish we had more. I hadn’t heard of this one, but steampunk and wuxia sound like a cool combination. It’s nice to hear that the anthology pulled it off well.